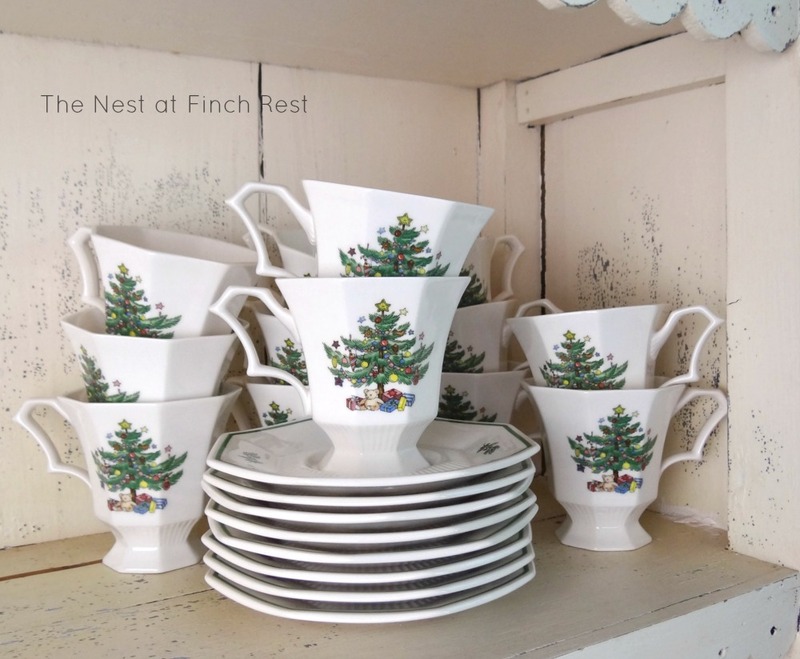 The Nest at Finch Rest: Christmas - Invite a Friend to Tea! Christmas - Invite a Friend to Tea! I am so delighted for the season to have officially begun! I have everything decorated except for the tree. It's been a cold grey rainy day here today, not good for photo shoots. invite a friend over for tea! for this much-needed and deserve respite. between the rush and hustle bustle of the season! or better yet - host a little tea time at your home. just tea and cookies, or something purchased from a bakery. The fact that you cared enough to invite is the true gift. and enjoying the company of someone special. someone who needs to maybe just simply be included? with your spouse! Why not!? Doesn't matter who we invite, as long as we do it! these next four weeks go by too fast! and plan to invite just one... or many! Don't wait, don't delay, just make it happen! Such a good idea, Michele. We don't think about making the time. We think about having someone over and don't follow through. Thanks for the inspiration. You have given so many great ideas here and very inspirational. I love it. Your cups and saucers are wonderful too! Thanks for the great suggestions! A very thoughtful idea, or rather, many! I wish I had your collection of holiday teacups and saucers. They definitely make your teatime and gatherings very special I'm sure. I'm inspired to have some quiet time alone or with a few friends. Thanks, Michele! Excellent post and reminder, Michelle. You know...I was just telling Stephanie on the day after Thanksgiving that I wanted to have a tea party for her and her precious little one. I have a dear friend coming this Friday for lunch and tea praying it will encourage her as she has been I'll for quite some time. and gifting with some baked goodies. This month can become so loud and busy with the world that it many times drowns out the good things. May we be sensitive to those around us and their needs. You have a beautiful heart Michelle, and it shows through out this lovely post. What a great idea - and I've already invited a friend to tea this month - maybe I'll invite another. I have that same christmas tea cup and pinecone cup - I like to use the christmas one a lot since it only gets to come out in December. We got a new neighbor a few months ago and I have not had a change to really talk to her, I think I will ask her to tea. Thanks for the idea. A lovely idea, Michele. A civilized time-out amidst the craziness. Such a beautiful post, the cups and saucers are a real delight and the idea of tea with a friend is wonderful. I have an elderly neighbour whose wife is in a Nursing home so I intend to visit the home and have him around for tea. Enjoy your tea time with a special friend. Lovely! A very blessed Advent season to you! Enjoy the advent season, Michele. Maybe one day we will enjoy tea together. what a wonderful idea in a beautiful setting. wish I was there to join in the fun. Michele, you are so right. This special time of year calls for a special tea time or coffee time with someone special. Love all your pretty china. Enjoy your special tea time. Thank you for sharing with us today and have a beautiful day. A lovely idea Michele. I am going to a friend's for tea on Monday with a few other friends. Such a special time of year. Enjoy! I have the top tea cup. It is Rosina - right - love the handpainting! Such a kind and thoughtful way to share a Tea Time. 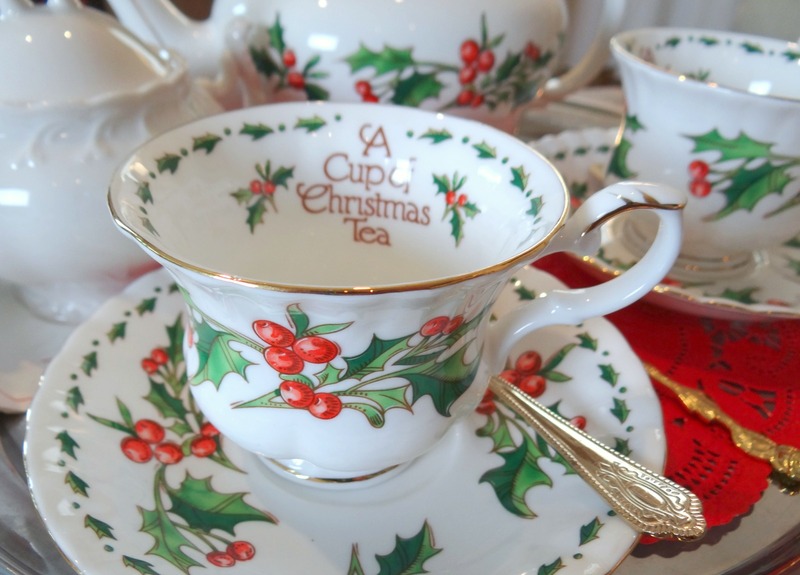 Love your pretty display of Christmas Tea Cups. I love this idea of having someone over for tea after the New Year when parties quiet down. Every year at Christmas time, my daughters and I hit the Drake for their Tea. We love it! A good idea to have someone over for tea, a time to slow down and enjoy conversation while sipping. I am stopping in through Roses of Inspiration. I think this is an such a gracious idea - certainly inspiring. My husband was behind me while I was looking over this post, and he said, "Wow, what beautiful dishes!" Simple and charming - just the way I like it. 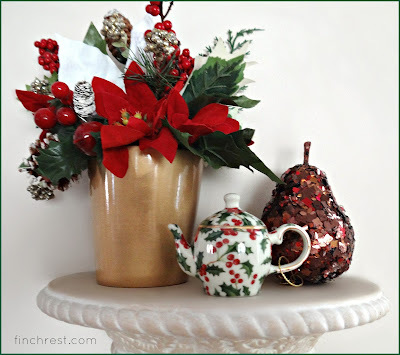 Love seeing all your Christmas teawares, Michele! I'm having some family over for a little Christmas tea party this coming Sunday. I'm excited to use my seasonal teacups and teapots! I was so pleased to see you sweet comment on my blog. If you still want to follow, I wanted to let you know that I think the problem with the followers gadget is fixed. I am curious to know if it indeed is. I had another person tell me that they were going to follow but could not. What a beautiful post Michele. I agree. The holidays come and go so quickly. It is always a good idea to take a little time to relax and gather ones thoughts. You a wonderful collection of holiday china. 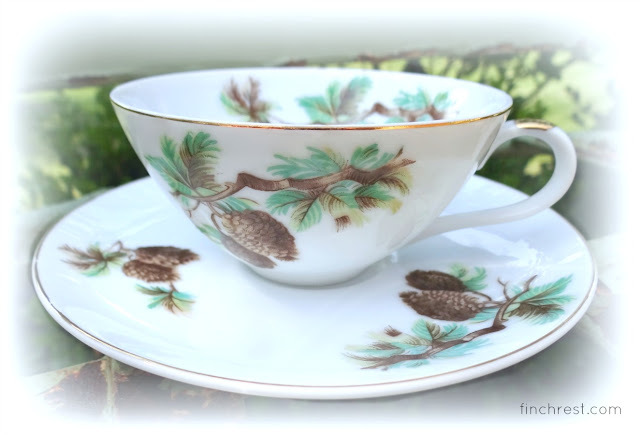 The acorn teacup is my favorite. Thank you for visiting me also. You are always so sweet. Great ideas,Michele, there are a couple on there that caught my attention. I'll get right on it! Hi Michele! Oh, this is such a great idea. We just seem to be so busy at this time of year and it's good to slow down and do something for someone else. Now you sure do have a collection of beautiful Christmas cups! Thanks for popping in to see me and the link. I'll go and check it out. You are so right, my friend, and I intend to have a few of these precious, tete-a-tete teatimes with people who are very dear to me, this season! 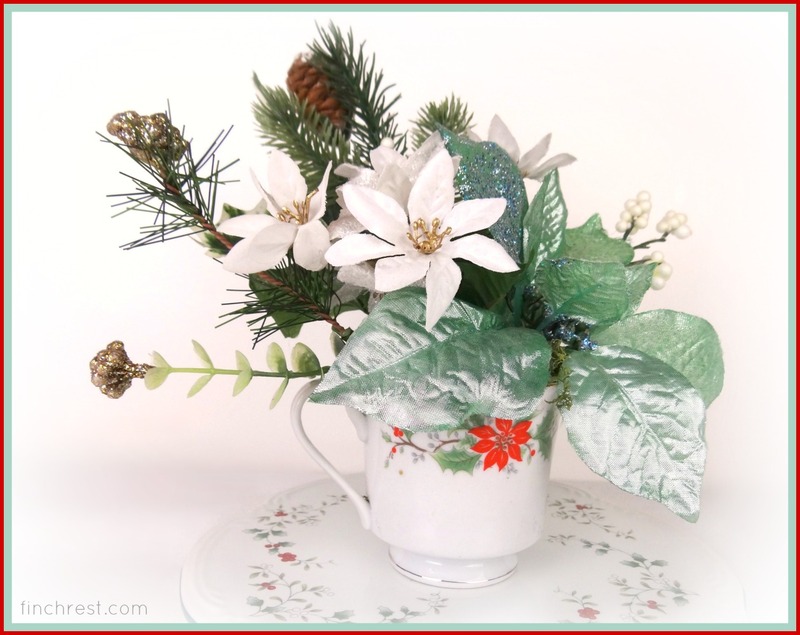 Your pics are all lovely, but the last one of the seasonal bouquet is so charming! Michele, you are invited to my table for a pot of tea anytime. Thank,you for your kind visit, and joying words. I agree; this is such a nice tradition at Christmastime with all the pretties set out makes a person feel welcome and special. Inviting a senior or a veteran is an especially caring, thoughtful thing to do. What a wonderful post, Michelle...and your collection of Christmas tea cups is just beautiful! Stunning photos! Thank you for sharing at the Thursday Favorite Things blog hop. I love hosting little get togethers. What a wonderful idea to have a tea party for the Holidays. Sometimes it is just so wonderful to feel connected to the community, doesn't it? What a great idea!! Want to come up to Michigan and have tea with me?! You are welcome any time, my dear. You are so right about stopping and sharing with others. I think time, t-i-m-e, is one of the most precious gifts we can give each other. What else is more important? What a beautiful thought! 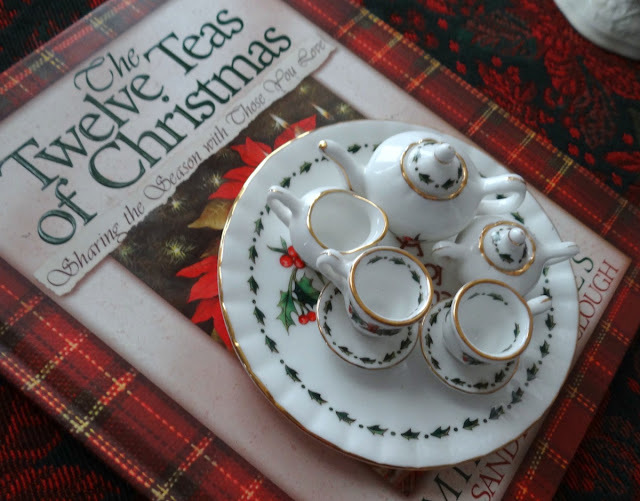 Simple pleasures of life :) Loving your charming collection of Christmas tea cups, they look so pretty and dainty! Happy Holidays~ warm hugs! 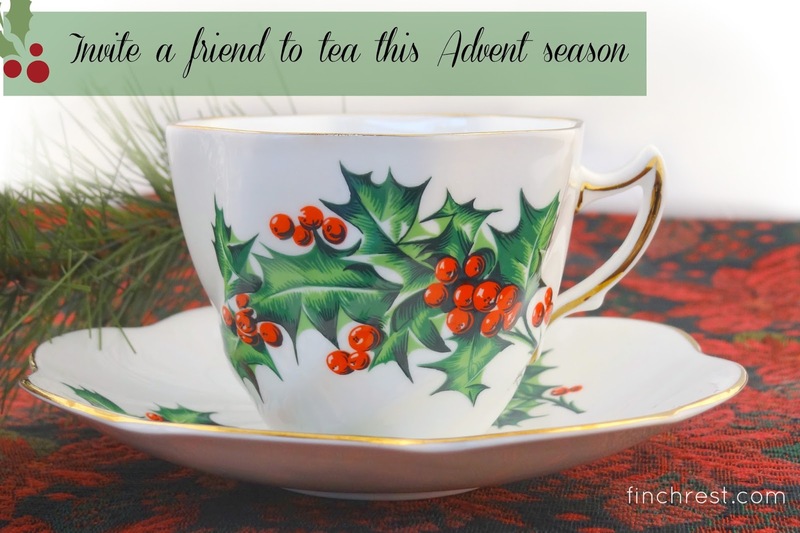 What festive teacups and having friends over for tea sound divine! Michele you are SO right! My friend called a week ago Sunday to invite me to have lunch the next day. I looked at my calendar cringing...there was SO much to do. But I went anyway. People are always more important than mindless stuff. We made such fun memories. Hope your tree is decorated now. 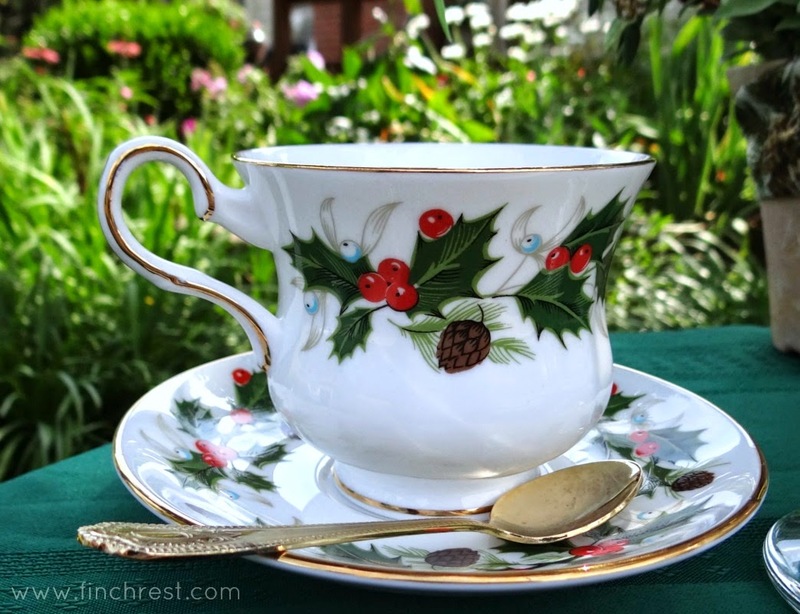 Beautiful teacups Michele, yes, we do need to be with friends and enjoy a cup of Christmas tea. Visiting and enjoying conversation develops lasting friendships. I hope you get your tree decorated soon!